138th Street in Hamilton Heights provides access to multiple sites relating to children. Currently, these sites include, but are not limited to: Riverbank State Park, McDonalds, PS 192, Jacob H. Schiff Playground, The City College of New York, St. Nicholas Park. As children walk from one location to another they engage and embed themselves along the way, activating 138th Street. 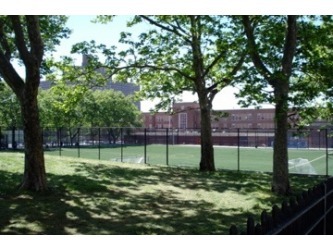 Riverbank State Park is home to structured and unstructured activities for children year round. Riverbank State Park and environs - Skateboarding: 679 Riverside Drive. 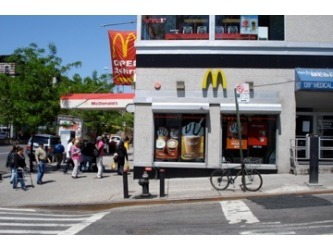 McDonalds is a international fast-food hamburger chain located on the corner of 138th Street and Broadway. McDonalds caters to children through their spokesman Ronald McDonald as well as their Happy Meals which were established in 1979. 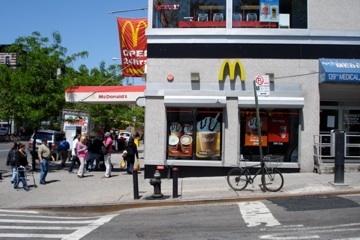 The proximity of this McDonalds to both PS 192 and the subway and bus routes found on Broadway insure constant pedestrian traffic to the restaurant. 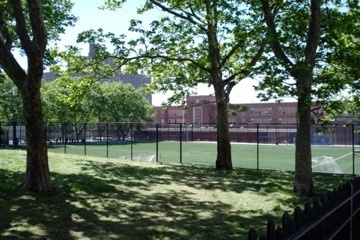 Jacob H. Schiff Playground is located East of PS 192. Jacob H. Schiff Playground: West side of Amsterdam Ave. btw W. 136th and 138th Sts. Hebrew Orphan Asylum was located where Jacob H. Schiff Playground currently resides. Built in 1878 due to overcrowding in other orphanages runned by the Hebrew Benevolent Society, it housed 370 children by 1884. It closed in 1941 and was used for army barracks during WWII, then The City College of New York acquired the building for dormitories. In 1952 the building was demolished. The City College of New York has long been a defining landmark of the Hamilton Heights neighborhood. The college primarily caters to students 18 and up, but the college also hosts summer camps and programs for ages 8-18. Additionally, the Salvadori Center in Wingate Hall at City College focuses on “improving children’s content understanding and problem solving skills by using project based learning focused on the built environment.” City College also caters to older age groups with the High School for Math, Science and Engineering primarily located in Baskerville Hall. Saint Nicholas Park has a variety of activities that appeal to many age groups. Educational components include the Hamilton Grange National Memorial. Active recreational elements include a playground, basketball and handball courts.